PLAYMOBIL Hiccup and Toothless with Baby Dragon (70037): Hiccup and Toothless lead the dragons and inhabitants of Berk on a fight against Grimmel. 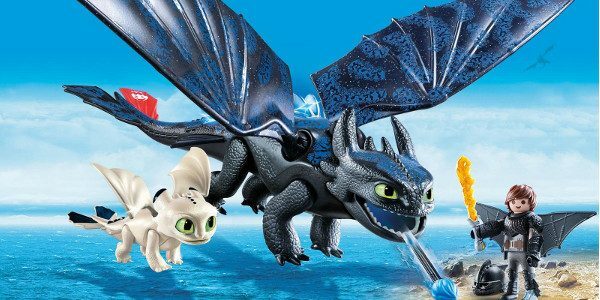 With illuminating back spikes and firecharged markings, Toothless goes on a new adventure to explore the hidden world, and Hiccup learns to be a leader even without his dragon. Set includes Hiccup, Toothless, blue fire darts, baby dragon, flame sword, helmet, and other accessories. PLAYMOBIL Light Fury with Baby Dragon and Children (70038): Take an exciting adventure into the Hidden World with the Light Fury. Much like her counterpart, the Night Fury, she protects herself with her pink fire darts and fire -charged scales that allow her to disappear into the sky. However, her white, sparkling scales, fast speed, and independence set her apart. Her curiosity sometimes gets the better of her, leading her and Toothless on exciting adventures. Set includes Light Fury, baby dragon, children, bucket, and other accessories. PLAYMOBIL Deathgripper with Grimmel (70039): Take on the most vicious dragon hunter yet, Grimmel, and his dragon, the Deathgripper. On his mission to eliminate the last Night Fury, Grimmel draws the inhabitants out of Berk into a quest to find the Hidden World. The Deathgripper is known for i ts large sharp tusks and spikes along its spine. Watch out for the acid that comes shooting out of its mouth and its tail that poisons its enemies with venom. Set includes Grimmel, Deathgripper, bow, and other accessories. PLAYMOBIL Hiccup and Astrid with Baby Dragon (70040): When danger threatens Berk, Hiccup and Astrid unite to protect their village. Their strong bond helps them lead the people and dragons they love to a new, safer life. Set includ es Hiccup, Astrid, baby dragon, log, fire, bucket, and other accessories. PLAYMOBIL Astrid with Hobgobbler (70041): Embark on an adventure to rescue the dragons with the fiercest Viking around – Astrid. Hobgobbler, who joins the crew after being saved from dragon hunters, finds himself along for the ride. Set includes Astrid, Hobbgobbler, flight suit, and other accessories. PLAYMOBIL Ruffnut and Tuffnut with Flight Suit (70042): Ruffnut and Tuffnut are back, and they’re still wreaking havoc in the s kies. Easily remove the flight suit to adjust Tuffnut’s beard and replace Ruffnut’s mask with her braids. Set includes Ruffnut, Tuffnut, armor, and other accessories. PLAYMOBIL Snoutlout with Flight Suit (70043): As cocky and confident as ever, Snotlout continues to be a courageous warrior. Designed to match his dragon, his flight suit is ready to take on the sky. Set includes Snotlout, flight suit, and other accessories. PLAYMOBIL Fishlegs with Flight Suit (70044): Join the very knowledgeable Fishlegs as he uses his flight suit to take on Grimmel. Thanks to his sensitive and caring nature, he has taken his dragon’s baby, who is safely tucked away and protected during their dragon rescue missions. Set includes Fishlegs, flight suit, baby dragon, and other accessories.